When you create with fabric and thread, every project is a journey. Where you end up and how you get there is all up to you...and your machine. With wireless connect via your PC or iPad and our fastest processor to date, you'll be there in no time- and the size is fantastic! 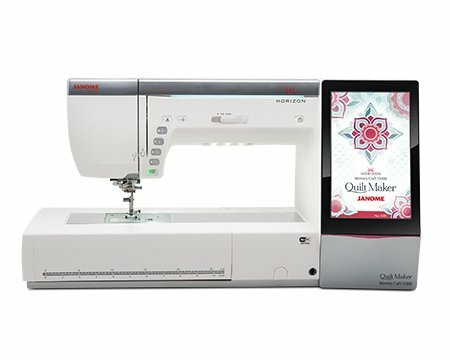 The Horizon QuiltMaker MC15000 comes standard with our largest hoop and has the largest touch screen we've ever made! Janome has developed five amazing iPad apps to help make your embroidery better- AcuDesign, AcuEdit, AcuMonitor and the new AcuSetter and AcuSketch apps. 11 Fonts with European characters, 2&3 Letter monogramming function, 510 Built-in Stitches, 480 Built-in Embroidery designs, 13 one-step buttonholes, automatic thread tension, automatic needle threader, WiFi Certified to work with our 5 iPad apps, memorized needle up/down, Automatic presser foot lift, One-step needle plate conversion, AcuFeed Flex Layered Fabric Feeding System, 7 piece feed dog, Stitch Composer stitch creation program, Free Arm, Drop Feed, variable ZigZag for Free Motion Quilting with width adjustment for satin stitch, Speed control slider, Locking stitch button, Automatic thread cutter with memory function, adjustable knee lift, 4MB of memory storage, LCD full color touchscreen, Foot pressure adjustment, Foot height adjustment, max. stitch width: 9mm, max. stitch length 5mm, Sewing application support with on-screen help. full intensity lighting system with 10 LED lamps in 5 locations, 15" embossed stainless steel bed, AcuView Magnifier in three different magnifications, top loading full rotary hook bobbin, max: embroidery size:9.1"x11.8", Design transfer options: Wireless, USB, Direct PC connection, Embroidery sewing speed: 400-1,000spm, Embroidery format: JEF,JEF+,JPX/ Editing functions: resize, combine, duplicate, rotate, flip, arc, group, drag & drop, zoom, trace, color choice/ programmable jump thread trimming, automatic enabling cutwork, auto return post thread break, adjustable hoop positioning, Available Hoops: GR:9.1"x11.8", SQ23:9.1"x9.1", SQ14:5.5"x5.5"
The MC15000V3 brings new features- an updated Horizon Link Suite, Ruler Foot, 1/4" Foot, and a stitch tapering feature.